The Physical and Occupational Therapy team were very good. I feel so much better and stronger than when I arrived. It was traumatic waking up in a place and not remembering coming there but the Van Duyn staff made me feel welcome and helped me transition wonderfully. Everyone here took good care of me. You guys are tremendous! You all seemed to prepare for every situation. I\'ve met all kinds of people asking me if I need anything. I absolutely love it here. I would recommend Van Duyn without hesitation. I have Marlene, Val and Nakita as my primary staff and they were always pleasant and helpful! The doctors and nurses were good, the social worker was nice and the concierge was good. My aide Mohammad made my stay more comfortable. The food was good, nursing was good, housekeeping was good and physical therapy was real good. PatriciaThanks so much for your kind words regarding Van Duyn Center for Nursing and Rehabilitation! Nursing and Physicians were good. My social worker and housekeeping were good. Overall things were pretty good. Eugene,Thanks so much for your kind words regarding Van Duyn Center for Nursing and Rehabilitation! I could not have been happier with my stay at Van Duyn Center for Nursing and Rehabilitation. The food has gotten better. The therapy was phenomenal (with special thanks to Chris, Yousef and Kurt) and I even enjoyed the recreation. Overall, I was pleased with this caring facility and my experience was positive. The best way to get to know a community is by scheduling a tour. See the facilities, meet the staff and residents, and get a feel first hand what it's like to live at Van Duyn Center for Rehabilitation and Nursing Nursing Homes. 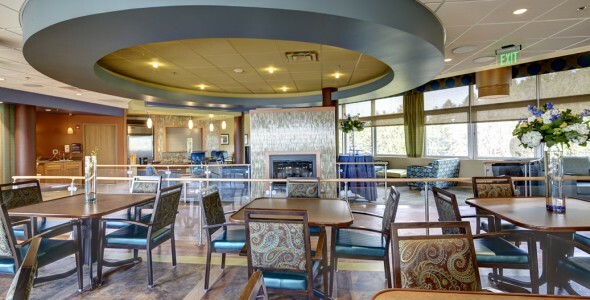 Van Duyn is a certified residential skilled nursing facility, providing short-term rehabilitation and long-term care to individuals with health conditions that require higher levels of medical and nursing services. Under the supervision of Van Duyn’s medical director, a team of physicians cares for each resident. A doctor is assigned to each nursing unit to assure continuity of care. Consultant physicians in the areas of dermatology, podiatry, urology, ophthalmology, neurology, dentistry, surgical and ENT are available to this qualified medical staff. Outpatient lab and x-ray services are provided, as needed. Registered professional nurses, assisted by well-trained and qualified licensed practical nurses and certified nursing assistants, provide 24-hour care. Nurse practitioners are also on-site each day to support the nursing and medical teams.